Pop 'Em, Drop 'Em SameGame is a simple-yet-engrossing puzzle game where you clear matching blocks in sets of two or more. Score high by clearing out more blocks at once. If you manage to clear the entire grid, you can keep on playing with a whole new layout. Getting rid of all those blocks is the key to raking in the points! Adjust the difficulty in a one-player game by trying different grid sizes and numbers of colors. Play it your way! Up to four players can face off in any one of three multiplayer modes. "Fame Game," the most straightforward choice, is similar to the one-player version. "Shame Game" turns the tables on the players, forcing them to go for the lowest score. Finally, in "Blame Game," it's a free-for-all as everyone vies for blocks on one big grid. Choose from among different block styles, background graphics, and music to customize your playing experience. 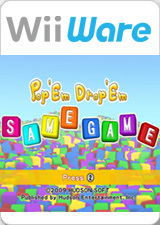 SameGame: easy to learn, easy to play...hard to put down! The graph below charts the compatibility with Pop 'Em, Drop 'Em SameGame since Dolphin's 2.0 release, listing revisions only where a compatibility change occurred.